Wanting to become the best teacher to your students? Want to impress the staff with your behaviour? Hoping to make a good impression and inspire your juniors every day? If the answer is a yes, then this post is a must for you. 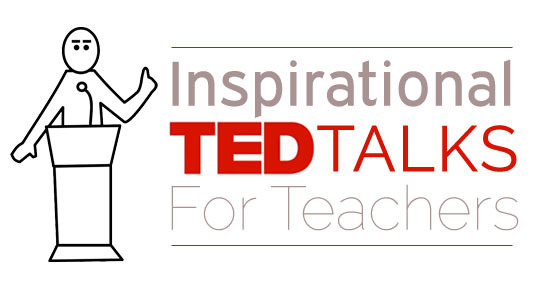 In this article we have enlisted some of the best ted talks for teachers that have not only motivated them all over the world but have also helped them become the best of the best! So keep reading the post to find out who they are. We promise you will be inspired. Tyler DeWitt is for all those teachers who teach science to their kids in school and wonder how they all end up yawning so quick. Yes! Science is not the easiest or the most interesting subject in the world but if you listen to what this guy has to tell, you definitely will be making it fun to learn. Tyler thinks that taking down notes and understanding the concept is a very simple and easy thing to do. It is just the beginning of something new. So what you as a teacher need to do is make things interesting and exciting. If you are talking about a virus and how they attack, make it sound like a horror story. Add cartoon characters to make it interesting. Tyler has also discussed several other points that will make teaching much easier and interesting. A second inspirational speaker who can change your mind on teaching is none other than Sugata Mitra. This lady has tricks up her sleeve you will absolutely love. She believes that more than speaking about a certain topic, it is highly important to create an environment that stimulates interest among the students. The students should want to seek knowledge instead of you putting thoughts into their mind all the time. Dan Meyer is a must for all those people who hate maths. If you are a math teacher, this guy could really help you at work. Dan believes that the subjects and syllabus these days are so water tight that they don’t allow the kids to learn new things on their own. Some of the major drawbacks that come with the present curriculum is that there is not enough initiative, not much perseverance among the students and retention is also lacking among plenty. What can be done to improve this situation is let students ask questions when they want to, use multimedia for help, encourage intuition of the students and make things less helpful. Salman Khan had also given a brilliant speech once on reinventing education. He is the creator of Khan academy where children are taught. The educational video provided by him discusses various subjects such as mathematics, science, several languages and others. The video teaches kids how to get their homework done and how the teacher can help them when the need arises. Psychologist Angela Lee Duckworth has some great ideas that could help you excel as a math teacher in school. She has learned in the past few years that IQ is not just the difference between your good and bad students. She likes to think what you really need is education which helps you understand students better and learn about them from a perspective that is motivational and psychological. After she finished teaching, she went to graduation school to finish her PhD in psychology. She says that a lot was taught to her during this time. Educator and author Ken Robinson believes that the system of America needs work. The crisis of dropouts is just at the tip of the iceberg: but what about those kids who are staying inside schools but could get disengaged. During this enlightening talk, Robinson has shared three principles on which the life of every human flourishes and how they can contradict today’s culture and education. Robinson also likes to believe that kids tend to prosper best when they have broad curriculum and education that is real. This should give some equal weight to science, maths, arts, physical education and humanities. Another inspirational teacher you must consult is Rita Pierson. In the past 40 years, this lady has learned a lot. A common thing that she has earned is the value and the importance of every human connection- building new relationships with students. She also tends to speak about the power that comes with apology, optimism and positivity. She does admit that it is a tough job but if you try, good results will definitely be shown. Rita Peterson has been inspiring people for generations and she will help you as well. An African girl once made a deal with her parent that she would go through the Masasai tradition of female circumcision if he allowed her to go the school. Her name Kakenya Ntaiya speaks about her story of going to college and working with the elders of her village to build a new school just for women in her community. This is not just her educational journey but also she managed to change the lives of destiny of a hundred and twenty five women. Her videos are an inspiration to the world and we bet she will help you too. You should always raise your kids to become entrepreneurs. Cameron Herold is one such person who tells us that we should stop punishing children for activities of business. Instead, they should try to foster their development. Even though the focus is quite specific, the core message must be translated much more ubiquitously. You should always teach the kids what they are good at and not teach them to more than adequate at a particular something they were not earlier. Jonathan Dori who happens to be an expert in the field of both media and education has stated that there should be a total of four questions for every listener and they should point out on how ideas must be explored and how hard it could be to shake the ideas once they have reached there. Dori has taken the time to review some of these bad practises and would like to serve in such a way that it reinforces the wrong ideas and in some way or the other helps the students do better and learn correctly. Alan Kay who happens to be a great inspirational speaker, especially for teachers had once stated the idea about ideas. He spoke about techniques which help in educating kids and what can be used to illustrate the experiences. He also looked at the simple matters as well as the complex ones and started to rely more on the ideas that are complex. His ideas are approachable methods of teaching which are very simple and intuitive. Clint smith happens to be a poet as well as a teacher who will inspire you like no other. He was in fact very much inspired by Martin Luther King and in fact used his statements several times to inspire the masses. If you havent heard him, we really don’t know what you are doing. He based the principles of his classroom based on those words and this is definitely the TED talk you should be able to share with all your friends. He is inspirational, funny, witty and an excellent speaker. Malala Yousafzai was once shot in her head by a gunman in Taliban because she had advocated education for women in Pakistan. Not only did that make her the youngest woman to win the Nobel Prize but also gave her immense respect and popularity in the world. Her father who is also an educator in Pakistan claims that the advocacy of Malala and the message that he has not only resonates with importance of education but also helps kids understand the value that they deserve in order to be treated equally. He also reminds us the value of education and it does instil the power that every educator can give to a child. Peter Doolittle who happens to be an educational psychologist has had humorous and insightful talk and describes to us how our memory works and that it allows us to do simple things such as storing information, experiences, information of the long term memory and also processes knowledge for the current goals. People who have a very high working capacity and are great storytellers have great writing and reasoning capacities. This brings the post to an end. If you were really hoping to land some good advice for your students, these speakers will definitely help you. All of them are professionals, have been in the business for very long and can provide with all the advice you need in order to help and inspire your children on a regular basis. If you have liked reading this post and would like to share some of your ideas, please feel free to comment in the box below. We would love to hear from you. On that note, good luck and take care!